So, maybe you have a weird Oktoberfest dream. Perhaps it goes a little something like this. You head out to the local beer hall, where your best pal, Friedrich, waits for you. He greets you with a smile and a hug, and then tosses a stein into your hand. He waves the bartender over and orders two lagers, one for himself and one for his best bud in the whole world. You share a toast and slurp down the delicious beverage as you both dance to polka music. A few beers later and you find yourself getting tired. You might not even be able to continue enjoying the Oktoberfest celebration as your feet begin to drag. “No worries!” shouts your friend Friedrich, ”I can carry my best friend during this momentous occasion!” He hoists you up and carries you to the bartender for one more lager. You both share a laugh and continue the fun festivities until the break of dawn and Oktoberfest is a smashing success. But perhaps this dream cannot be a reality for you. Perhaps your best friend has a bad back and is unable to lift you in your time of need. What’s a guy to do? 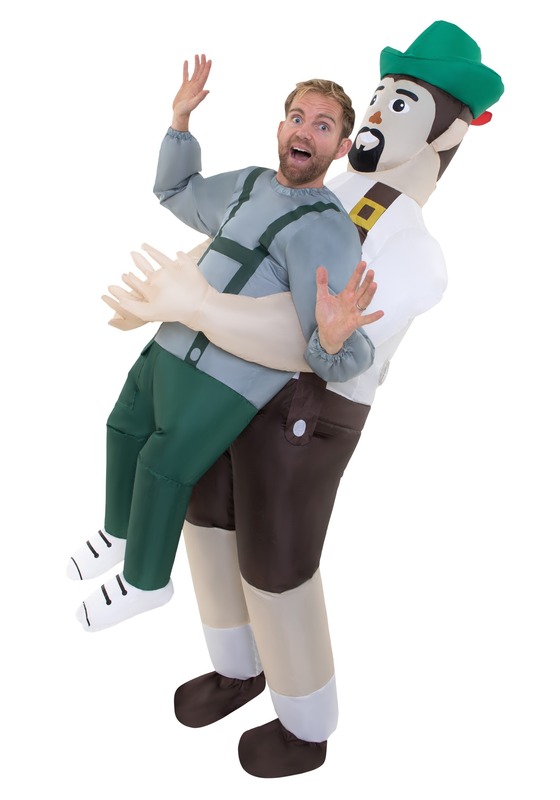 Well, your Oktoberfest dream can come true with this Inflatable Pick Me Up Bavarian costume. The costume comes with an inflatable suit that’s made out of windbreaker-style material. It comes with a fan and motor that fully inflates the costume. When fully inflated, it looks as though your Bavarian best friend is carrying you around the beer hall! Even if your real best friend may not be able to carry you across the finish line at Oktoberfest, this big Bavarian buddy will help you enjoy the holiday the way it was meant to be enjoyed… with plenty of laughter!